We don't eat them a lot, but I have a soft spot for baked potatoes. This is an unusually glamorous and slightly labour-intensive version from The First Mess. Laura Wright's photos capture waxy white potatoes piled high with bright-orange cauliflower and chickpeas, spattered with spicy hot sauce. Mine don't have quite the same show-stopping qualities, but they're quite the comfort food nonetheless. We correctly deduced that this recipe is a weekend project, so we set about it on a Sunday and doubled the filling recipe to ensure some leftovers (I've just left it at a single quantity in the recipe below). My pot-full of cauliflower and chickpeas never quite took on the saucy consistency of Wright's, most likely due to the combination of constrained hot sauce and chopped roasted tomatoes I used, and I added some extra tomato paste to try to thicken it all up. It helped a bit. We loved these hearty carb-boats of spiced stew, but I'm not sure in what context we might make them again. It's all far too effortful for a snack, and yet doesn't quite feel like a balanced main meal. Maybe a big handful of green leaves on the side is enough to call it so. Wash and dry the potatoes, trim off any weird bits and poke a few holes in them with a fork. Rub a little oil over them and place them in a large baking dish; sprinkle them with salt. Bake the potatoes for 1 to 1 1/2 hours, until they're tender in the middle. While the potatoes are baking, set your largest pot over medium heat. Pour in just enough oil to thinly cover its base, then saute the shallots until softened, about 5 minutes. Add the celery and saute for a further couple of minutes; stir in the paprika and garlic. Add the cauliflower and chickpeas to the pot; pour over the stock and stir to combine. Add whatever tomato ingredients you're using, plus the hot sauce, and stir some more. Add pepper to taste. Cover with a lid, first bringing it all to the boil, then turning it down to a simmer and cooking until the cauliflower is tender, up to 10 minutes. When the potatoes are ready and cooled just a bit, slice them in half longways. Arrange them cut-side-up on one or two baking trays. Use a spoon to scoop out a shallow bowl shape in each one (just a tablespoon volume! ), and eat the scooped bits. Scratch up the remaining potato a little with a fork. Pile up cauliflower filling into each potato, then bake them until they're just starting to brown on top, about 15 minutes. Scatter with parsley and serve. Edit 15/05/2018: New School Canteen closed last year. We've noticed that the inner north's cafes are less busy on Golden Plains weekend, and we try to take advantage of it. This year we ventured out to Fitzroy's New School Canteen, which Steph & Hayley had been urging us to visit. They were impressed by the array of vegan and eggy breakfasts, respectively, and knew I'd be all over the 'dessert breakfast' section of the menu. Sadly, by the time we gave New School Canteen a shot the menu had changed and 'dessert breakfasts' were no longer a feature. For us sweet lovers, the solitary option was a chia pudding - no thanks! Rather, there's an abundance of rich savoury eggs, breakfast burgers and toasties (including vegan cheese!) with a superfood-styled rice bowl and grain salad as exceptions. Michael was, of course, spoiled for choice. He was impressed by the panko-crumbed poached eggs ($17.50) served with green papaya slaw, chilli jam, and tofu so deeply braised that it was nearly black. He missed his toast, though, just a little. I sipped on an orange, mango and passionfruit juice ($5.50) and sought out something that wouldn't be too greasy, settling on the vegan smashed avo & feta ($8.50). Welp, I was served this. Can you spot the avocado? Nope, that green there is herbs.... and those other dabs are vegan feta. The avocado turned up as just a few smooth green splodges in amongst layers of fresh tomato slices and a big scoop of fresh tomato-based salsa - it didn't have much flavour and no texture, and if it hadn't been marked vegan, I'd've wondered if it was that commercial dip that's padded out with cream cheese. The almond-based feta was beautiful (possibly the Vegan Dairy one?) and the price was very reasonable, but this was not as advertised. So I'm not so keen to return to New School Canteen for breakfast, although over our meal I told Michael I'd be curious to come back in the evening for one of the 5 vege burgers. Having looked at their facebook page, I'm less sure - they seem to be revelling in the over-the-top double-dripping-cheese triple-patty trend that repels me. The venue is spacious, lets in lots of natural light and they're training some plants across frames. Yet it still comes across a little sterile, and the acoustics are terrible - on a quarter-full morning, it took a single well-behaved table of six nearby to render a one-on-one conversation between Michael and I difficult. New School Canteen's attention to veg options is commendable, but for me they're falling short on too many other criteria right now. I'll read others' ongoing accounts with interest while keeping to Fitzroy's countless other more winning eateries. New School Canteen has received positive accounts on Tess Presso, Ferris Wheel Flights, Barley Restaurant Reviews and Gourmet Chick; the diners on Whatever Floats Your Bloat had a more mixed experience. Accessibility: Entry is flat and tables are reasonably spaced. We found the acoustics to be quite echo-y even when quarter-full. We ordered at our table and paid at a low counter. From memory, male and female ambulant and unisex fully accessible cubicle toilets were available. When we're feeling lazy on a Friday evening, we're lucky to have the Snug close by. 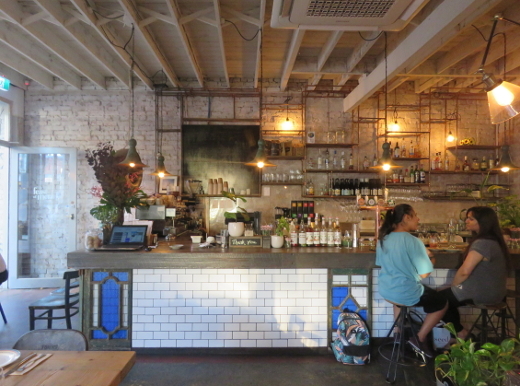 (South-siders can no longer say the same, with their St Kilda sister closing this month.) We've been pleasantly surprised to find that even as folks clock off for the week, the back garden is not necessarily packed with drinkers and smokers. Their vegan menu has stabilised somewhat since our first visit. 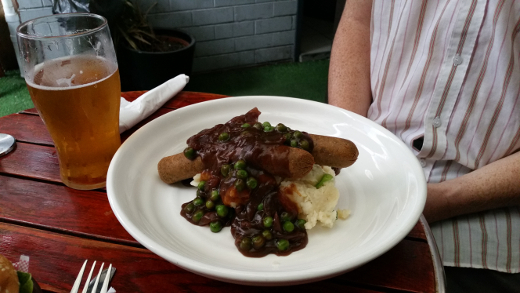 Michael went back to the bangers'n'mash (now $26) - it's a filling but not over-the-top serve with a lovely red onion gravy. Little else on the menu looks familiar but plenty looks appetising, from cauliflower poppers to shepherd's pie, spaghetti alfredo and three mock burgers. Super Salad aside, this vegan pub menu is very heavy on the mock meat and won't suit all tastes. But for those of us already enamoured with the Cornish Arms down the street, the Snug is a neat and perhaps cosier alternative. 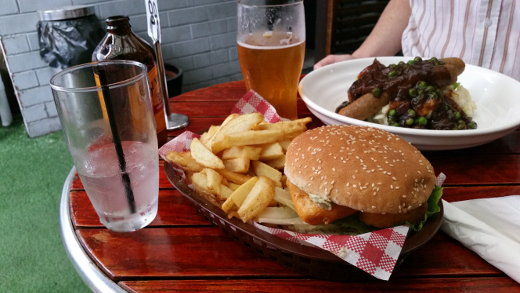 You can read about our first visit to the Snug here. 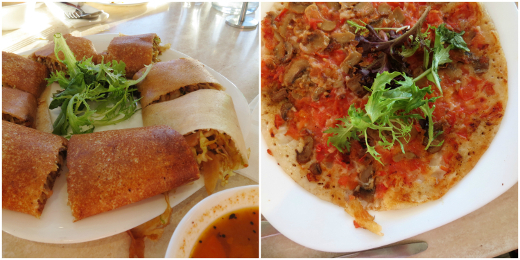 Since then Veganopoulous has posted a thorough review of their vegan menu. Accessibility: The interior is crowded, with a mix of tables and high seats at the bar. The courtyard has bench seats and stools. We ordered and paid at the high bar. I made this slice specifically for slouching on the couch and sharing with a friend on a Sunday afternoon, and I can't imagine a better setting for it. It's got a biscuity almond & oat base, jammy berry filling, and messy swirls of peanut butter and peanut polka dots on top. Even for those of us who didn't grow up with peanut butter and jelly sandwiches, it's a charmingly childish and comforting snack. I suspect a lot of ingredients here could get swapped for convenience: rolled oats and almonds could sub out for flours and other nuts, any frozen or fresh berries would do, and what about other nut butters? There is one component that's a bit sensitive, though! I thought keeping my base almonds chunky would be fun, but it just rendered the base greasy with oil and too crumbly to support the slice in our hands. I'll blend all those base ingredients much more thoroughly in future. No matter - little spoons and plates just enhanced the cocoon we created, a snack-lined safe-haven of pickle-flavoured chips (! ), iced tea, craft projects and a few sly episodes of The Good Place. Preheat an oven to 180°C. Line a 22cm-square baking tray with paper. For the base, place the rolled oats, almonds, salt and sugar into a food processor and blend thoroughly to a meal (I left mine chunky and it was far too crumbly in the finished dish!). Transfer the mixture to a small bowl and stir through the coconut oil. Press the mixture into the base of the baking tray, using the back of a spoon to even it out. Bake for 15 minutes. Turn up the oven to 190°C and bake for a further 5 minutes, until the edges have begun to brown. While the base is baking, place the jam and berries into a saucepan and set them over medium heat. Stir them regularly while they cook for 5-7 minutes, until they're well combined and pourable. Take the saucepan off the heat. Turn the oven back down to 180°C. Once the base is cooked, pour over the berry mixture and spread it out evenly. Dab the peanut butter in little teaspoons spotted across the surface. Send the slice into the oven for 5 minutes, then pull it out and drag a skewer or toothpick through the melted peanut butter to create a marbled effect. Sprinkle over the peanuts. Return the slice to the oven for another 10 minutes, until the jam is starting to bubble. Let the slice cool to room temperature over the course of 1-2 hours before cutting it into squares and serving. Store any leftovers in the refrigerator. Late in 2016, the Melbourne veg*n grapevine was buzzing with rumours about a new vegan pizza place in Collingwood. The opening got postponed a few times and the excitement steadily grew. So when they finally threw their doors open, it didn't take long for us to join a gang of Melbourne veg*ns to go and check them out. 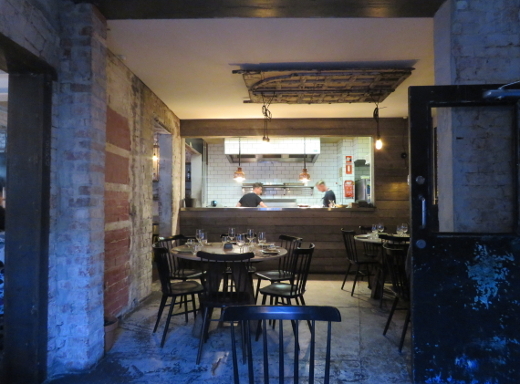 Part of the delay in their opening was related to the transportation of their fancy pizza oven - they're going for a similar thin-crust wood-fired vibe to the much loved Gigi in Sydney and they've got the setup to match. The menu has something for everyone - classics like margherita, mock-meat extravaganzas like pepperoni and healthier options like the supergreen (spinach and kale pesto with broccoli and zucchini). We ordered eight pizzas between the eight of us, and the staff were kind enough to cut things into (uneven) eighths to make the whole sharing experience easier. 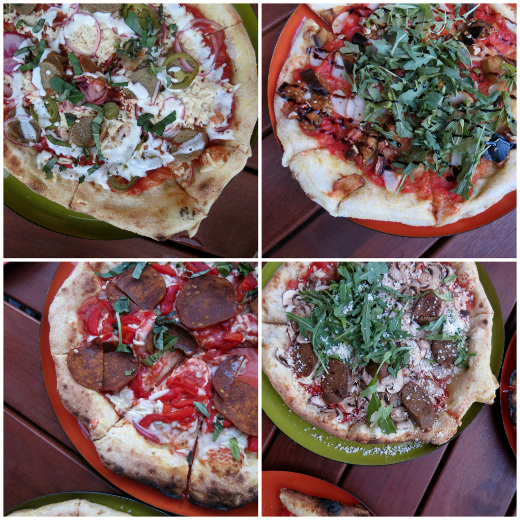 The first four, clockwise from top-left were: the classic sausage (bbq base topped with beer brat, jalapenos, red onions, mozzarella and aioli, $18), the eggplant (tomato base, smoked eggplant, pear, rocket and balsamic reduction, $18), the Italian sausage (a special, $18) and the pepperoni (tomato base, roasted capsicum, pepperoni, mozzarella, oregano, $17). First to the bases: I thought they were excellent, a little bit crispy, but still with a lovely softness to them. The toppings were a bit more of a mixed bag - the classic sausage was universally praised, with a great mix of spiciness, sauciness and chunky mock-meat goodness. The others drew divergent reviews: some people loved the pepperoni, but there were complaints that it lacked spice, while the cheeselessness of the eggplant made it a touch on the dry side for some. The Italian sausage hit the mark pretty well, but didn't quite measure up to the classic. 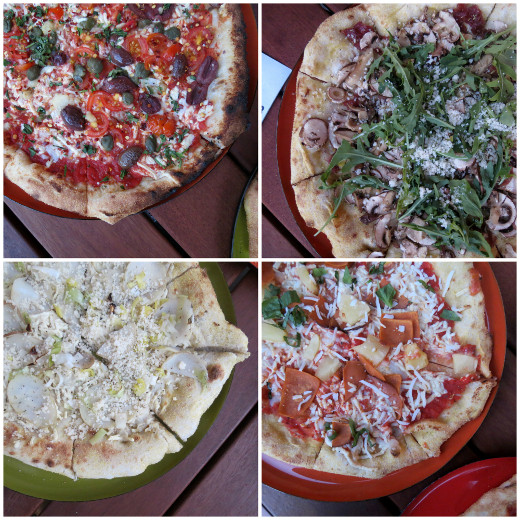 The next four were the puttanesca (tomato base with cherry tomatoes, garlic, capers, olives, parsley, chilli flakes and mozzarella, $18), the mushroom (white base with porcini and Swiss brown mushrooms, caramelised onions, thyme, parmesan, rocket, oregano and truffle oil, $19), the controversial Jóhannesson (tomato base with ham, pineapple and mozzarella, $17) and the bianca (white base with potato, leek, rosemary, garlic confit, mozzarella and paremsan, $16). The mushroom and putanesca were both excellent - even if some at our table complained about the amount of rocket on the mushroom - while the bianca was sadly let down by some undercooked potatoes and leeks (it didn't seem like they were pre-cooked, and the pizza cooking time didn't get them as soft as we wanted them). The Jóhannesson, a topical special) was as divisive as pineapple on a pizza usually is - people who like Hawaiian pizzas had no complaints, while the rest of us steered clear. It's other surprise was a scattering of shredded coconut, which was less offensive than it sounds, sprinkled amongst the vegan cheese. We'd gone too hard on the pizza to try and of their salads or desserts, so there's still more for us to explore on the menu. I was mostly impressed - they're making upmarket vegan pizzas, meaning they're working a very different vibe to the junky Eat Pizza or the over-the-top Cornish. A few people at our table were a bit underwhelmed, but struggled to name a better option for vegan pizza in Melbourne. I reckon they'll work the few kinks out as they go along - there's clearly a huge demand for a vegan pizzeria based on the full house and steady stream of takeaway pick-ups we saw on our visit. We'll definitely return. Future King and Queen plus Rose & Bean have already reviewed Red Sparrow, and both were very positive. Accessibility: There's a flat entryway into a fairly crowded interior, plus some tables on the street. Seating is a mix of high stools and regular tables and payment happens at a high counter. 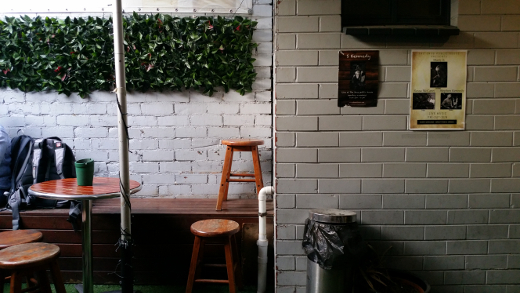 The toilets are unisex, but in a pretty inaccessible courtyard out the back. Dosa Plaza is an unassuming eatery holding up the corner of an apartment complex in Preston, where High St and Plenty Rd fork off. We'd paid only passing attention to it, until a couple of friends invited us to try it out with them after work. Opening and discussing the menu was an excursion in itself - it's all vegetarian and stretches to over two hundred items. Vegan, gluten-free and onion-garlic-free dishes are clearly marked, and there's even a 3-page summary sheet of vegan foods available on request. This was a journey that started briefly with pasta before focusing on Mumbai chaat, the Punjabi foods found at most Indian restaurants across Australia, and then south Indian delicacies - idlies, vadas, dosas and uttappas. Chinese fusion dosas, Mexican fusion dosas, Indo-Chinese dishes, desserts and drinks. Phew! We tried our best to sample across the board. 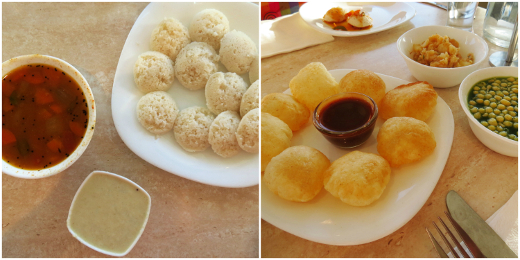 A dozen mini-idlies ($8, pictured above left) were an auspicious start, freshly steamed and a little sweet, with plenty of sambar and coconut chutney for seasoning. I delighted in introducing my companions to pani puri ($9, pictured above right): tapping the crispy shells open and carefully stuffing them with spiced potatoes, tamarind chutney and chilli-mint water, then stuffing it all in your mouth at once. It was after these appetisers that most of our drinks arrived. 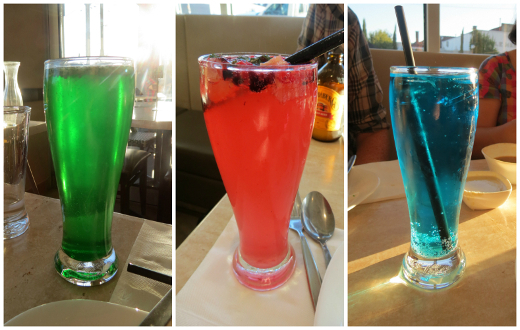 We heard the tell-tale sounds of Soda Stream carbonation between deliveries of ginger mint lemonade ($5), lemon berry punch ($5) and the Cool Sky mocktail soda ($4.50). They were all as silly and sweet as they were colourful. We also enjoyed the hyper-coloured paneer tikka kebab ($10.50), a mild and tender treat with a light, minty dipping sauce. Next we got deep into dosa territory. The spring roll dosa ($13, pictured above left) was not, as Michael had hoped, literally stuffed with deep-fried spring rolls. Rather, the dosa played the role of the pastry, wrapping itself around a very tasty medley of spring onion, cabbage and carrot in sweet soy sauce. It's a ridiculous novelty that actually really works! Now completely sold on their fusion fancies, we embraced the tomato mushroom uttappa ($11.50) as some kind of pizza, carefully slicing off segments of the pancake and triple-checking that there wasn't any cheese to spoil it for our vegan companion (there wasn't, and she loved it). If the meal had a pièce de résistance, it was the Schezwan Sizzler ($16.50). It fittingly arrived last, sizzling and steaming and bursting with foods we never dreamed of combining. Vegetables and mini-idlies were stir-fried in a hot and sweet sauce, paired with a mountain of orange noodles fried with green vegetables, and all topped with French fries. It was monstrous, it was magnificent, it is surely a worthy successor to the halal snack pack. Giddy with the spectacle of it all, we couldn't walk out without dessert. The sweet coconut dosa ($7.50) was stuffed with shredded coconut and jaggary, reminding me of a chewy, caramelised ANZAC biscuit in the best possible way. We left Dosa Plaza near-delirious. Its flouro-lit fit-out is nothing special, but it's the home of some preposterous fusion foods, many of which we really enjoyed and would order again. With everything from $6 snacks to $16 sizzlers it caters to a variety of appetites, if only you can figure out which part of the enormous menu to order from. Dosa Plaza Preston has previously received a positive review on quinces and kale. Accessibility: Dosa Plaza has a flat entry and well-spaced tables. We ordered at our table and paid at a high counter. We didn't visit the toilets. I was travelling for my job during the week leading up February Ottolenghi club, which meant I wouldn't have time to make icecream. Instead I made posset! I've tried my hand at posset once before 5 years ago, funnily enough for the same reason; I guess a dish of refrigerated cream and sugar is the next obvious choice after a dish of freeze-churned cream and sugar. I've since learned that curdling the cream is another essential part of posset. This allows the dessert to set to a velvety self-supporting consistency in the fridge. Ottolenghi's version uses lime zest and leaves to infuse the cream, then lime juice for the curdling. He'd have us pile it up with papaya for serving, but I preferred to use mango. The overall effect is both rich and refreshing, sweet and sour - a beauty in its own right, and not simply an icecream understudy. Place the cream in a large saucepan. Bash the lime leaves with a mortar and pestle to release their fragrance; add them and the lime zest strips to the cream. Turn the heat up to medium-high and bring the mixture just to a simmer. Turn off the heat and allow the cream to infuse with the lime for 30 minutes. Add the sugar and salt to the cream and set it back on medium-high heat. Bring it all to the boil, stirring regularly. Boil until the cream almost bubbles up to the rim of the saucepan and turn off the heat. Strain out the lime pieces. Stir in the juice of one lime, which might curdle the cream a little. Strain the mixture again, this time pouring it equally into 8 ramekins or cups. Refrigerate for at least 4 hours. When it's time to serve dessert, dice up the mangoes and dress them in the remaining lime juice. Spoon the mangoes onto the posset cups and sprinkle over the fine lime zest. We had such a great time at January's Ottolenghi-club, that we reconvened just a month later for Febru-lenghi, another celebration of Yotam's ridiculously good recipes. You'd think it would be getting hard to keep standards high, but this felt like one of the best club-meetings ever - you can get a full run-down over on our facebook page. I was home alone for the week and got a bit carried away, committing to three different dips - butternut and tahini spread, avocado and broad bean dip and this butterbean hummus with red pepper and walnut paste. This was all a fairly significant time commitment, although a lot of it was spent just waiting for things to roast or cool. The end result was amazing though - each one of these dips was somebody's favourite around the table. The beautifully fresh avocado and broad bean dip was the most summery, while the sweet and nutty pumpkin dip was a bit heartier. The fanciest of all was the butterbean hummus, which basically combined two dips - a red pepper paste reminiscent of the sauce we made for the eggplant kataifi last time and a pretty simple hummus. It's a winning combination and the stylish thyme and walnut garnish made it the most visually appealing of the three. The roasting and peeling of the peppers, chilli and garlic takes up a bit of time, but once that's done everything comes together very quickly. I can recommend serving with Turkish bread from A1 Bakery - they bake it to order and it is goddamn perfect. Stay tuned for Cindy's dessert contribution next! There really is no better club than Ottolenghi club. Start by roasting the peppers. Heat the oven to 220°C and lay the peppers, chillies and garlic cloves out on a baking tray. Cook for 20 minutes and then take out the garlic and chillies, putting them aside in a bowl covered with cling-wrap. Keep the peppers going for another 20 minutes or so, until the skin is nice and blackened, then add them to the bowl and leave to cool. Once everything is cool enough to handle you can peel and de-seed the chillies and the peppers and get rid of the garlic skins. Pop the peeled garlic, chillies and peppers in a food processor along with a generous sprinkle of salt and the thyme leaves and blitz it all to a paste. Add the tomato paste, vinegar and paprika and blitz again. Stir through half of the walnut pieces (the rest will be used as a garnish). The first step for making the hummus is to make your oil nice and fragrant - put the crushed garlic clove and thyme sprigs and the olive oil into a saucepan and cook over medium heat until the garlic just starts to caramelise. Remove the clove and set aside a couple of tablespoons of the oil and the thyme sprigs for later. Pour the rest of the infused oil into a food processor with the butterbeans and half a teaspoon or so of salt and blitz to a paste. Add water until you've got the hummus at the texture you want it to be. To serve, spread the hummus out on a plate with a high ridge around the edge. Spoon the pepper and walnut paste into the middle before sprinkling over the walnuts, drizzling with the oil you've set aside and garnishing with the thyme sprigs. Cindy's started doing a bit of work out at Monash which, if nothing else, gives us an excuse to meet up in Richmond after work for dinner. We'd heard good things from friends about the food at Feast of Merit, a social enterprise that raises money for YGAP and serves up Middle-Eastern inspired goodies all day long. It's a lovely space - lots of light streaming in through the big windows and a nice buzzy atmosphere without being deafeningly loud. The menu is pretty standard mid-range Melbourne: small, medium and large share plates with lots of veggie options and then nothing but meat under 'protein'. 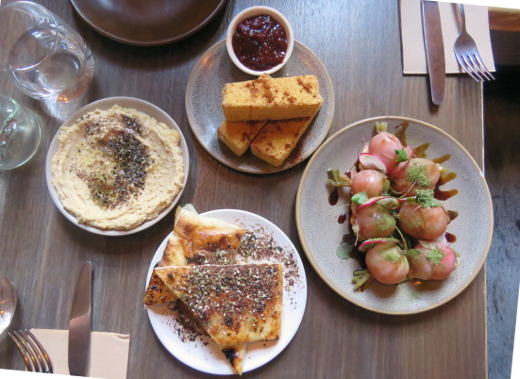 The staff gave us a good idea of sizing and we ordered a good mix from the small and medium sections, starting with chickpea chips with tomato jam ($9), braised radishes with pomegranate molasses and leaves ($9), caramelised onion hummus ($8) and za'atar grilled flatbread ($5). They were a beautifully presented selection of dishes that took up almost our whole table. The chickpea chips were probably my favourite - smooth on the inside with a nice crust, while the bread/hummus combo was inevitably a success. I wasn't really into the radishes - I think the texture of braised radish just isn't really for me though, because Cindy happily plowed through them. 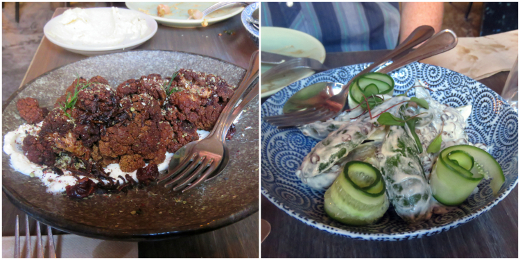 We ordered two bigger dishes to follow up - fried cauliflower with crispy onions, hung yoghurt, sour cherries and chervil ($18) and a cucumber, lentil, baharat salad, with buttermilk and almonds ($18). Cauliflower really is an unsung hero of the vegetable world, especially when it's roasted or fried to within an inch of its life (see also Tahina), and this dish was my favourite of the night - the yoghurt and cherries adding sweet and sour notes to the beautifully earthy cauliflower. The cucumber dish was a nice, light accompaniment, with lots of fresh cucumbers given a bit of heft by the lentils. Cindy was eyeing off the impressive-sound desserts (peanut butter and raspberry sponge with basil! ), but we'd gone too hard on the savouries and had to call it quits. Another time. Feast of Merit is well worth a visit - the food is thoughtful and well executed and there's a good range of vego dishes to choose from (vegans might struggle however - all the non-meaty larger dishes seem to include dairy or eggs by default). We had friendly and efficient service and really enjoyed the space, all with the added bonus that your money is going towards a progressive cause (although I'm a bit sceptical of these kind of ventures after the Shebeen debacle and YGAP's entrepreneur-focussed approach to development isn't really my favourite - still: it's got to be better than an entirely for-profit business). Having said all that, we probably won't hurry back - Feast of Merit is doing the kind of food we can get get closer to home at Rumi, Teta Mona, Morrocan Delicacy and Mankoushe. 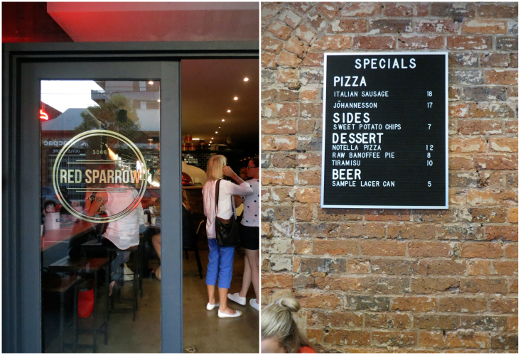 It's a genre of eating that Melbourne is doing very, very well. If anyone has any other tips for places around Swan Street that we should check out, we'd love to hear them. Feast of Merit gets pretty universal praise from food bloggers both for dinner: Trading Plates, Lips Temptations, foodie about town, Sammy Says, Little Caps, The Baroness of Melbourne, A Chronicle of Gastronomy, Dammit Janet I Love Food, The Spice Adventuress, Petit Miamx, Food Rehab, Spoonful of Sarah and Second Helping and breakfast: The Very, Very Hungry Caterpillar, lifestyle by lily, Peach Water, I'm So Hungree, Emoji Food Review and The Brick Kitchen, although In Love With Brunch, Stuck in Transit and The New Fave had some complaints about the service. Accessibility: There's a a flat entryway into a spacious interior. There's full table service and accessible toilets.